If you think California has seen some wild weather recently, fasten your seat belt. An eye-popping new study from climate scientists at UCLA projects big increases in the frequency of extreme events at both ends of the wet-dry spectrum: big flood-inducing storms as well as droughts. "I can definitely attest to being unnerved by some of our findings," says the normally restrained Daniel Swain, lead author on the study. The team looked at specific extreme events in California's past and used a suite of climate models to project their frequency in the future. Those events included last year's "whiplash" winter that drenched the state after a five-year drought, as well as the state's driest year and the epic floods of 1861-62. That was the winter Gov. Leland Stanford attended his own inauguration by rowboat. 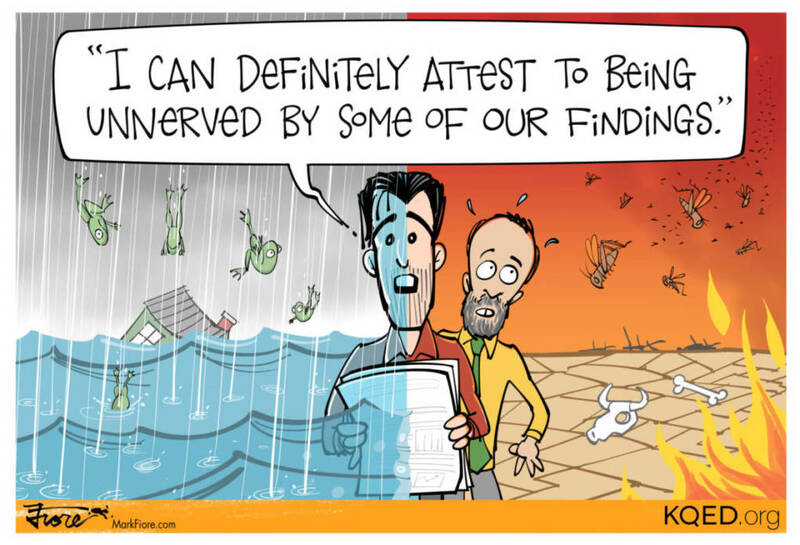 "It was kind of a biblical flood," says co-author Alex Hall, who directs the Center for Climate Science at UCLA. "It was 40 days straight, practically, of rain." Hall and Swain estimate that a similar event today could trigger a $1 trillion catastrophe. And they say it will happen again, perhaps sooner than scientists had previously reckoned. 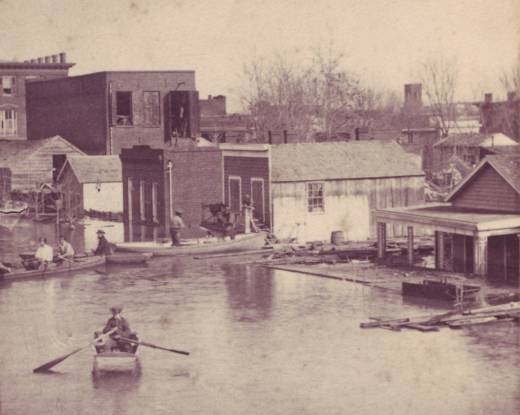 The study, published today in the journal, Nature Climate Change, estimates that the Great Flood of 1862 was a once-in-200 year event at the time that it happened. Now, their projections indicate we can expect an event on that scale about every 50 years, and that it's "more likely than not" we'll see a recurrence sometime between now and 2060. "I don’t think that we are prepared for that type of event," says Hall, recalling the February 2017 storms that triggered widespread flooding throughout the state and mass evacuations along the Feather River after the nearly catastrophic failure of the spillways at Oroville Dam. Researchers looked at last year's record-setting precipitation and projected that kind of whiplash winter will also be a more frequent feature of California's hydrologic cycle, approximately doubling in frequency from its prior 25-year interval, a trend they say will be "noticeable" by 2035. "We know that these events happen," says Hall. "They’re a natural feature of the climate system here in California — but, we expect them to become much more frequent in the future because of climate change." The same goes for droughts, according to the UCLA study, which also looked at the state's driest winter on record, 1976-77. Previously about a 100-year event, a single dry year of that severity would be expected to happen every 50 years, with greater frequency in Southern California. "It’s definitely very sobering and it’s something that we have to plan for," says Hall, who admits to having a "pearl-clutch moment" when he first saw the data from his study. His preview of the then-unpublished work generated by far the most buzz at a recent symposium on extreme precipitation at Scripps Institution of Oceanography in La Jolla. But he says there may be a (somewhat tarnished) silver lining behind all of the dark clouds produced by his work. "If the planet comes together and eventually reduces or eliminated greenhouse gas emissions," suggests Hall, "then we can avert some — not all — of the risk of these types of events occurring." It's important to point out that the team used a pessimistic "business-as-usual" projection of future greenhouse gas emissions in their calculations -- in other words, they assumed that emissions are not significantly reduced in years to come. Swain says they chose this over a more optimistic mid-range assumption partly because, it's "still (unfortunately) the closest to the actual observed emissions trajectory," and that their scenario would, "likely apply even under very optimistic future emissions trajectories, but the magnitude of the changes in frequency would be substantially less on a lower emissions path." Other findings from the study were arresting as well. Among other things, the team projects a "sharpening" of California's precipitation calendar, with more falling during the core winter months (November-February) and less during the spring and fall shoulder seasons. That has implications for runoff and water supply that will force a rethinking by water managers around the state. "I think in general climate change is forcing us to confront the fact that we are not living in harmony with our environment," says Hall. "All climate change is doing is forcing us to confront that fact sooner, and this is an example of that."